These were the type of phrases bantered about on Wednesday, May 5, at Social Entrepreneur Day, part of Detroit Entrepreneur Week, May 2-7, 2016. The day was presented in partnership with Build Institute, which is a strong advocate for social enterprise and small business support. For the 120 Social Entrepreneur Day attendees, who filled a spacious room at TechTown Detroit, the day started off with an overview of social entrepreneurship (the pursuit of a social mission using commercial means). 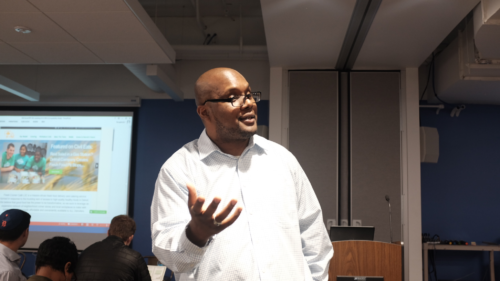 Marcus Harris, Build’s facilitator of Build Social, small business taskmaster, and one of social entrepreneurship’s most vocal champions quickly captivated the audience with his wisdom. Shaka Senghor sharing his story with the audience. Shaka Senghor, a New York Times best-selling author, presented next. With the story of his personal turnaround, triggered by an epiphany inside a prison solitary confinement cell, he spoke of his journey into crime and drugs, through his 19-year incarceration, and out into the world to become an author, social entrepreneur, and change maker. The Detroit native’s current work focuses on mentoring youth, eradicating gun violence, and getting more books into prisons. 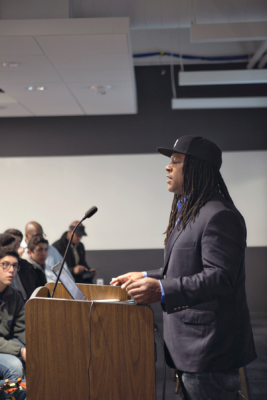 Senghor’s entrepreneurial challenges were greater than most: out of prison for second-degree murder with little chance of finding a job, he sold his books from the trunk of an old Honda Civic and drove from school to school talking to kids and telling them his story. He wrote, slowly gained notoriety, and started a mentoring program for at-risk youth. He presented one of the top TED Talks of 2014, and was awarded fellowships with M.I.T. Media Lab and the W.K. Kellogg Foundation. Marcus Harris, Build Social facilitator shares the COSTARTERS business model canvas with the crowd. Following Senghor’s motivating words, was a social entrepreneurship ideation session that lead participants through a visual map, a CO.STARTERS CanvasTM (an entrepreneur training curriculum Build brought to Detroit) that helps entrepreneurs better understand, define, organize, and test their business ideas. Delphia Simmons, Build Basics facilitator, speaking on the “Meet the Social Entrepreneurs” panel. The group answered questions about their early inspirations, handling competition, balancing money issues with social purpose, and dealing with doubt. 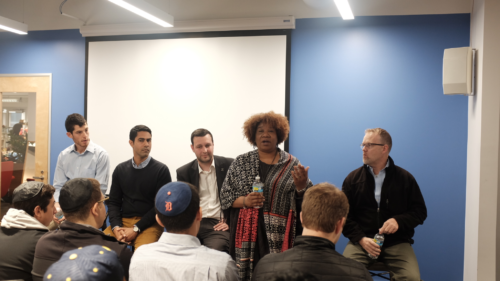 When asked about challenges specific to Detroit’s social enterprise movement, many panelists voiced concern over the absence of resources in Detroit – good schools, lack of money, subpar city services – but also recognized that Detroiters have the drive and grit to keep going. For Detroit entrepreneurs knowledge is just one piece of getting a business going. Capital is still a huge challenge, which is why programs such as Kiva are vital. Therefore, it made sense to culminate Social Entrepreneurship Day with an activity focused on pitching ideas and giving away money for startups.